The ECB has finally announced last week that it would be lowering its main refinancing rate from 0.25% to 0.15%, and that it would lower the rate it pays on its deposit facility from 0% to -1%. The ECB hopes to incentivise banks to take money out of that facility and lend it to customers*, providing a boost to the broad money supply and counteracting deflation risks. The interest rate of the ECB deposit facility is supposed to help the central bank define a floor under which the overnight interbank lending rate (EONIA) should not go. The reason is that deposits at the ECB are supposedly risk-free (or at least less risky than placing the money anywhere else). Consequently, banks would never place money (i.e. excess reserves) at another bank/ investment (which involves credit risk) for a lower rate. When the deposit facility rate is high, banks are incentivised to reduce their interbank lending exposures and leave their money at the ECB (and vice versa). On the other hand, the main refinancing rate is supposed to represent an upper boundary to the interbank lending rates: theoretically, banks should not borrow from another bank at a higher rate than what it would pay at the ECB. In practice, this is not exactly true, as banks do their best to avoid the stigma associated with borrowing from the central bank. Unfortunately, there is a fundamental microeconomic reason why banks cannot diminish their lending rate indefinitely. I have already described how banks are not able to transmit interest rates lower than a certain threshold to their customers due to the margin compression effect (see also here). Indeed, banks’ net interest income must be able to cover banks’ fixed operating costs for the bank to remain profitable from an accounting point of view. When rates drop below a certain level, banks have to reprice their loan book by increasing the spread above the central bank rate on the marginal loans they make, breaking the transmission mechanism of the lending channel of monetary policy. As we have already seen, in the UK, that threshold seems to be around 2%. We can notice the margin compression effect on the first chart. 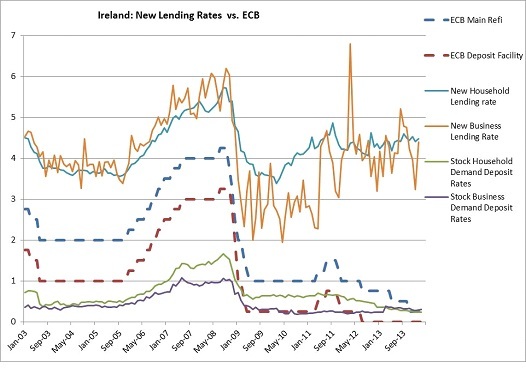 The lending rate stops dropping despite the ECB rate falling as banks reprice their lending upward to re-establish profitability (evidenced from the second chart, where interest rates on new lending increase rather than decrease). Clearly, what happens in the UK regarding margin compression also occurs in those countries. 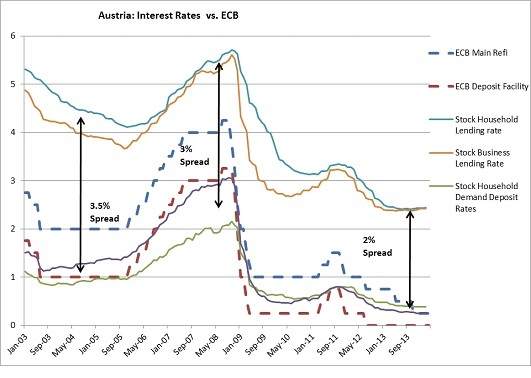 When the ECB rate dropped, outstanding floating rate lending rates also dropped (because floating rate lending is indexed on either the ECB base rate or on Euribor), causing pressure on revenues. 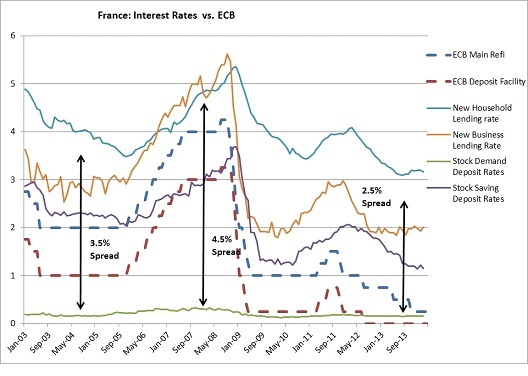 As long as deposit rates could also fall (this varies a lot by country, as French banks never pay anything on demand deposits), the loss in interest income was offset by reduced interest expense. But once deposit rates reached 0 and couldn’t fall any lower, banks in those countries experienced margin compression and their net interest income started to suffer. Moreover, this happened exactly when loan impairment charges peaked because of increased credit risk. Nonetheless, the ECB had been trying to revive, or encourage, interbank lending throughout most of the crisis, and had already lowered to its deposit rate to 0%. Nevertheless, banks maintained cash in those accounts. Why would a bank leave its money in an account that pays 0%? Because banks adjust those interest rates for risk. An ECB risk-adjusted 0% can be worth more than a risk-adjusted 4% interbank deposit at a zombie/illiquid/insolvent bank. However, the ECB is clearly not satisfied with the situation: it now wants banks to take their money out of the facility and lend it to the ‘real economy’. For a bank to remain economically profitable (or even viable in the long-term), the rate of economic profit must be at least equal to the bank’s cost of equity. To maximise their economic profits, banks look for the most-profitable risk-adjusted lending opportunities. ‘Lending’ to the ECB is one of those opportunities. Placing money at the ECB generates interest income. This interest income is more than welcome to (at least) maintain some level of accounting profitability (though not necessarily economic profitability) when economic conditions are bad and income from lending drops while impairment charges jump***. With deposit rates at 0, banks’ income became fully constrained by financial markets and the economy. With rates in negative territory, not only banks see their interest income vanish but also their interest expense increase. From the equations above, it is clear that it makes banks less profitable****. On top of that, lending that cash can make banks less liquid, which increases their riskiness and elevates their cost of capital (the ‘Q’ above). The question becomes: adjusted for credit and liquidity risk, is it still worth keeping that cash at the ECB? The answer is probably yes. To summarise, ‘II’ is negatively impacted by a low base rate whereas ‘IE’ reaches a floor (= margin compression). 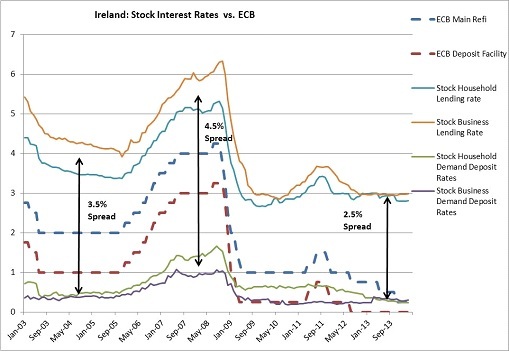 ‘IE’ then increases when the central bank deposit rate turns negative. Meanwhile, ‘OC’ increases as loan impairment charges jump due to heightened credit risk. Profitability is depressed, partly due to the central bank’s decisions. A counterintuitive (and controversial) approach to provide a boost to lending would be to subsidise even more the banking sector by increasing interest rates on both the refinancing and deposit facilities. Defining the appropriate level of interest rates would be subtle work though: struggling over-indebted households and businesses may well start defaulting on their debt. On the other hand banks’ revenues would increase as margin compression disappears, making them able to lend more eventually. The subtle balance would be achieved when interest income improvements more than offset credit losses increases. Not easy to achieve, but pushing rates ever lower is likely to cripple the banking system ever more and reduce lending in proportion (while allowing zombie firms to survive). Furthermore, banks are repricing their loan book upward anyway, making the ECB rate cuts pointless. The process takes time though and it would be better for banks to rebuild their revenue stream sooner than later. The ECB could still use other monetary tools to influence a range of interest rates and prices through OMO and QE measures, which would be less disruptive to banks’ margins. * This does not mean that banks would ‘lend out’ money to customers, unless they withdraw it as cash. But by increasing lending, absolute reserve requirements increase and banks have to transfer money from the deposit facility to the reserve facility. ** Data comes from respective central banks. They are not fully comparable. I gathered data from many different Eurozone countries, but unfortunately, some central banks don’t provide the data I need (or the statistics database doesn’t work, as in Italy…). Spreads are approximate ones calculated between the middle point of deposit rates and the middle point of lending rates. Analysis is very superficial, and for a more comprehensive methodology please refer to my equivalent posts on the UK/BoE. *** Don’t get me wrong though. Fundamentally speaking, I am not in favour of such central bank mechanisms as I believe this is akin to a subsidy that distorts banks’ risk-taking behaviour. In a central banking environment, like Milton Friedman I’d rather see the central bank manipulate interest rates solely through OMO-type operations. I myself had been planning to blog on this topic, and I may yet. I agree with everything you say. Banks chiefly make money by gathering below-market retail deposits and then lending them into wholesale money markets; secondarily, they make loans with spreads above their cost of funds. Banks have spent huge sums building deposit-gathering networks to obtain below-market consumer deposits. When inflation and interest rates are zero, those deposits cost more to obtain (due to overhead) than wholesale funding from the market. The banks are thus losing money on their core intermediation business. Net interest income has been kept afloat by the high yield of the banks’ dwindling asset books (bonds, mortgages, etc. ), but this is a wasting asset. Once this endowment effect is gone, they will have no recourse but to push outwards on the maturity and risk spectrums. They will have strong incentives to play accounting games which inflate current income at the expense of future income, and to take long-term bets which are inappropriate for a deposit fiduciary. These chickens will start coming home to roost very soon, assuming that banks cannot fully control their financial reporting. In many countries, such as Japan, they can control their reported numbers. Whether that is true in Europe remains to be seen. The only way to interrupt this disaster scenario would be for the ECB to raise inflation and interest rates to their pre crisis levels, which is not in the cards given its commitment to deflation. I’m not sure banks will necessarily have to push outwards on the maturity and risk spectrum as long as there is enough new lending volume to reprice upward their loan book without increasing its risk profile. The effects though is that any interest rate cut will not be transmitted to new borrowers. I also think inflation is unnecessary, but higher rates (excluding their inflation premium) are.